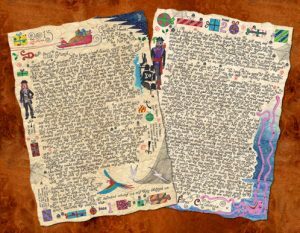 For those of you who like to follow the progress of my Father Christmas story-letters… I wanted to write this quick post to let you know that I’ve now finished the first of this year’s new printable letters, “Father Christmas and the Pirates”. (Yay!) It should be available for you to print from September 2013 onwards, when you’ll be able to find it on this page of the Rooftop Post site. I should add that I’m very happy with it; the story has turned out pretty well and I’m pleased with the illustrations. As you may know, I’ve developed a very particular illustrative style for the Father Christmas letters – slightly child-like and attempting to look spontaneous, as though Father Christmas himself sat down and painted the little pictures as best he could. They’re what I would have wanted when I was a child. 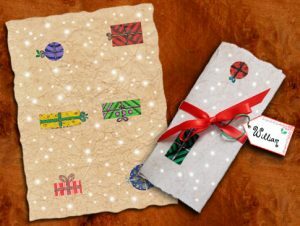 The letter is written as though Father Christmas is on his way around the world on Christmas Eve. Over the years I’ve completed many similar letters telling stories from his sleigh, but this is the first time I’ve built a story around pirates. As with all my Father Christmas letters, I’ve tried to strike a tone which is exciting without being scary, so that children of all ages can enjoy it. Of course, I’m never sure exactly who each letter will be most popular with – boys, girls, older children or little ones – and it often surprises me who likes what most. As far as “Father Christmas and the Pirates” goes though, I’m thinking slightly older children may like it best, for after all it’s two pages long, rather than the usual one. Anyway, if you’re printing it this Christmas, I hope it goes down well in your house… and that you enjoy it too. So what’s next? Well, I’ve now moved on to the first “before Christmas” letter of the season. It’s called “Father Christmas and the Christmas Tree” and I suspect it will become a favourite. It’s a particularly magical one – and I have to say I loved writing it. It takes you right into the heart of everyday life at Christmas House, with magic around every corner and in creating it I completely lost the afternoon. Time flies when you’re at the North Pole! As with all the printable letters, “Father Christmas and the Christmas Tree” will be addressed “Dear little friend” so that you can print it straight out, but for anyone wanting that personalised touch, the nice folk at Rooftop Post have created some printable name tags. They look gorgeous if you roll up your letter and tie it with ribbon. (Which is certainly what I’ll be doing for various little members of my family!) If you are folding or rolling your letter, you might want to remember to print a pretty design on the back of the letter too. Once I’ve finished the letter about Father Christmas and his talking Christmas tree, I shall be moving on to another one for before Christmas. This time, I expect I’ll go for something about Rudolph. I mean everyone loves to hear about him, don’t they? I shall have to have a think about what he’s been up to this year. Wish me luck!